Designed by adventurer Robert Young Pelton and handmade by LionSTEEL in Northern Italy, the HEST II is an upgraded version of the knife that changed the way adventurers think about brutal-use knives. The 3.15" (80mm) blade of the HEST II is made of German Niolox steel with a 61 Rockwell hardness. Because the knife is tool steel, and not stainless steel, it is easier to sharpen but may oxidize if not properly cared for. Rust only affects the appearance of the knife and not the performance. Like all DPx Gear knives, we ask that you use a whetstone or diamond sharpener to dress the edge, and NEVER use a motorized grinder. The blade is 0.187" (4.8mm) thick and features three sizes of wire strippers and a pry notch. There's a hex driver at the hilt and a wire breaker at the base of the blade. We removed a lashing point in the pommel because we found it unnecessary, and we changed the pry bar angle to better fit the size of the knife. The HEST II has a hollow handle designed for storing survival materials like fire starter or water-purification tablets. The scales are attached with two slotted/Allen screws. 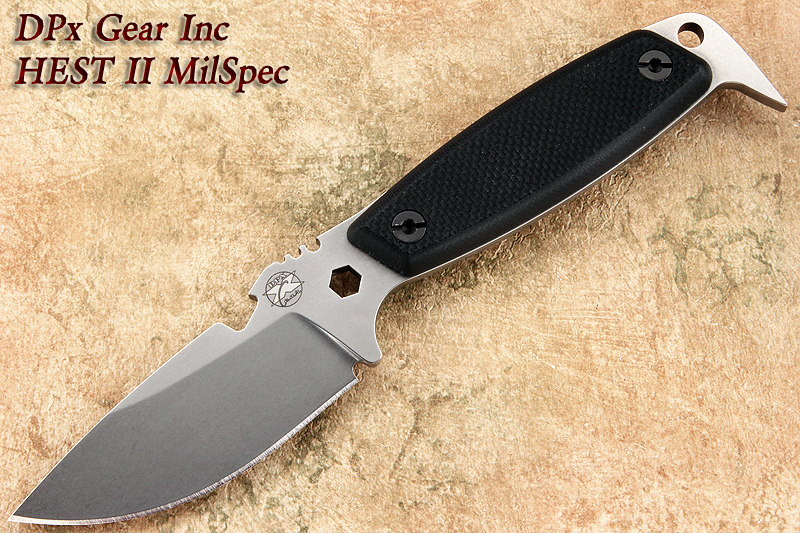 The HEST II Milspec is a take-to-the-fight, low-profile duty knife. The handle is American G10 scales and features a stonewashed German Niolox steel blade with 61 HRC. The Milspec weighs 4.85 oz. and comes with a black Cordura sheath with a sleeve for a sharpening rod or fire starter.